You may be wondering why you would want to add manual intervention to an automated test run, I used to have the same thoughts as you, but I have seen the benefits of the approach. Before we start it is important to understand that normally any manual intervention in an automated test run is a bad idea, for one thing the tests will not run. Manual verification: You might have to verify objects that cannot be mapped, or are difficult to test, eg. Flash, Silverlight. External processing: In order to automate the end to end process a batch process might have to be executed. If you can use Axe to execute the batch process great. I have used manual verification successfully on a project a few years ago to verify the look and feel of a website, and I currently need to use external processing to test an ETL process. For those of you that do not know what an ETL process is, it is basically Extract, Transform and Load. Testers do that all the time trying to set up test data. I know that some of you are asking why we cannot use Axe to stop and start the ETL process. The answer is “Yes we can, but this is the first implementation of the ETL process and we have now ironed out the bugs”. To change the manual steps to automated steps using Axe is really easy and can be done later. Enough ramblings, lets get to how we implement the functionality. I am going to assume that you have a project library file and ActionMap. As always you can always download a working zip file from here and unzip to your C:\ drive. We are going to implement parts of the .NET MessageBox class, specifically a standard dialog with an OK button, and a dialog with Yes and No buttons. The latter can be used for manual verification. 5. Next step, create a Subtest page for the mapped objects. As you can see from the Actions, the MsgBoxOk class is overloaded with the possibility to have a title on your dialog box, eg: set( MessageBox title). The MessageBox text is read from the data column in the test step. As in the MsgBoxOk class the MessageBox text is read from the data column. 6. Last step is to download the example and try it out. I hope that you found the blog interesting and understand the potential to have manual intervention in an automated test. ComputerWeekly.com IT Blog Awards- Please vote for us! This is just a short message to let you know we have been shortlisted for the ComputerWeekly.com IT Blog Awards in the Company/corporate SME's category. We are in category 6: Company/corporate: SME's as seen in the image below. Thanks for voting, and happy testing! From Infrastructure - We have upgraded the network and are expecting an increase in throughput. Can you please run a quick test and let us know the improvement stats? From a Developer – We have made some changes to the framework and are expecting some issues. Can you please run some tests and let us know the error codes? 1.Axe and WatiN installed and configured. 2.A WatiN project with a local Action Map and custom library file. 3.Download and install the free Basic Edition of HttpWatch. 4.Add two methods to the custom project library file. 5.Modify the local Action Map and Run config files. The output from HttpWatch is a hwl.file per Axe test, so if you have 100 Axe tests, you will get a 100 hwl.files. Not a good thing, when you are pressed for time. To minimise the time spent pouring over the output files you should create a test run that exercises most pages, and add a switch to the Run config file to turn the HttpWatch logging on or off. I downloaded the free Basic Edition of HttpWatch (http://www.httpwatch.com/download/), version 6.2.10 and installed it using the default options. A HttpWatch folder was created in my ProgramFiles folder on the C drive. If you do not have a custom project library file, see the Axe documentation for creating one. The first step is to add a reference to HttpWatch to your custom library project. There are two variables in the CloseHttpWatch() method , testID and resultDir that need to be declared and set. This is done in the __testPrefix section of the Local Action Map. This is where you turn on the HttpWatch logging. The code looks for a value of TRUE to start logging, any other value and the logging will be turned off. You should now be able to Build and Run your Axe project and view the HttpWatch output in the Results directory. Integrating HttpWatch into Axe does not make Axe a performance test tool, but it does give you some extra ammo in the hunt for bugs. Users must extract the zip file to c:\nfocushttpwatch because some paths are hardcoded for expediency. Announcements, a catch up and watch this space! Firstly, I must start this entry with an apology for being away from the blog during the last few weeks... 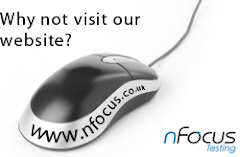 It's been a busy period over here at nFocus, especially during the last few weeks, but I am glad to be back, and writing. Secondly, I need to thank all of our visitors for taking the time out to read our articles over the past few months. It makes me proud to announce that in the short time the blog has been online, we have achieved over a 1000 visits, and our last article, 'Automated Functional Testing Tools, QTP vs Selenium,' was our most popular article so far! 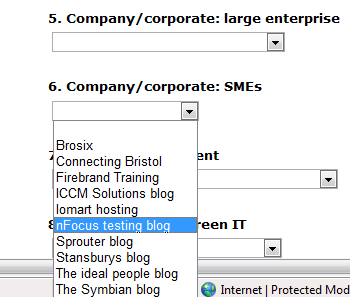 I am also proud to announce that the blog has been entered for this years Computer Weekly IT Blog Awards for the Corporate SME catergory, so thank you for nominating us, and I will do my best to keep you updated with how this goes. "I have been a software tester for over 10 years, and learnt a long time ago that the only way not to drown in a sea of regression is to automate as much as possible, using a good test framework. I do not like the idea of creating automated regression packs after the product has gone live, but instead prefer to automate as you go along. When your overnight run takes longer than 12 hours, it is time to get another test rig." The practical walkthough is titled, "Using Non-Functional Test Tools with Axe and WatiN," and we will publish it here within the next week. Hi all, been away for a bit, so apologies. At nFocus we've been using selenium for a while now and I've always been interested in what the uptake might be in the coming weeks/months/years. As with all these tools, there are always pros and cons and the real winner often depends on the individual requirements for an automated tool. It's difficult therefore to produce a generic, objective comparison between two tools, so, when I came across this blog entry, I was suitably impressed : "QTP Vs Selenium"
What is interesting about this is that QTP wins in some situations and Selenium in others for example Selenium supports a better range of OS/platforms due to is Java nature, whereas QTP wins on its breadth of applications supported (Selenium just does Web Browser based apps). "Selenium recognizes objects on the basis of the DOM structure of the HTML Page. The UI objects in selenium have vague descriptions and don't comply with WYSWYG policy." Axe has an ObjectMap spreadsheet where you can abstract the logical object names away from the physical recognition strings, thus the user is given the ability to use friendly object names. AutomatedQA just released it's latest version of it's TestComplete offering - version 7 ! ...it seems that the biggest news is the addition of it's keyword tests or otherwise known as keyword-driven tests. It is clearly trying to compete with some of the test automation frameworks such as Axe from Odin Technology. I'm gonna be giving this version a trial over the next couple of days and will report back on my findings. Watch this space for an update on the trial! If, however, we are to test a native iPhone app, then this proves to be a little more tricky. The only way to really test it before it goes live is on an actual iPhone itself or from within the development environment. There does not appear to be any emulators out there on the windows platform right now and with the absence of any sort of controller you are going to be limited to just manual testing. If anyone knows of a good simulator or test automation tools for iPhone apps, then let me know!